It is incredible how women today are breaking the glass ceiling and striving professionally which is good - But if you are a WOMAN reading this guide tell me are you able to keep the romance alive in your relationship? While the kind of freedom that comes with success cannot be emphasized more, bu it is equally important that you maintain a work-life balance. This does not only include giving ample time to yourself, but also to your partner and keeping the romance and spark alive in your love life. Being in a relationship and simply letting everything happen by itself is a recipe for disaster. You have to take charge of certain things and mold it according to your needs and, of course, your partner’s. No doubt, you are successful in your profession. But you will only be successful as a person when you are successful in things which make you human. This stands true when your relationship is lacking the spark which it earlier had. Although there might be things where you do not have control, such as a cheating partner. But if and when everything is going fine, you should not let that slide away (if you want it, that is). There are some things you can do to keep the spark alive. A relationship, is after all, like a baby. You have to nurture it to let it grow healthy. We all know how important communication is. It pretty much holds the same importance for maintaining the romance in your relationship. If you feel like something is not right, talk it out. If you have questions, ask them. Whatever it is, just talk. Holding things inside is not going to do anyone good. It is quite harmful to your relationship. And when its disastrous effects surface, it will be too late. Of course, there are second chances. But let’s face it. Things will never be the same again. So why reach that stage in the first place where you need to give it another try? Ask your partner how their day has been at the end of the day. Tell him about your day. Did Susan give you the looks for not inviting her to your barbeque dinner last weekend? Tell him. We are sure you both will have a lot of things to share about your respective days. Even gossip, if you must. Yes, that also helps build a romantic relationship. No kidding! Don’t be silent regarding anything. And if there is something bugging you, simply let it out. Do not expect your man to understand everything. They are not mind-readers. And the same goes for you. Ask him if there is something going on in his mind. Just let him pour out. Do not try to read his mind. Chances are, you will misinterpret things. For an everlasting relationship, communication is the key to keep the romance alive. This also resonates with paying attention. When you love someone deeply, you pay attention to the little details about them, right? That is what your partner thinks as well. So if he feels like you are not paying attention to them, there are chances that he will try to look for it somewhere else. Especially when they have done something for you and are dying to get your attention to it. This might seem superfluous. But trust us, these little things have a lot of significance. And it is these little things that stack up and lead to greater things (for the better, or for worse). It could be a new haircut or a new suit, let them know that you have noticed it. And compliment if you have really liked it. The importance of attention in a relationship cannot be emphasized more. Everyone wants the attention of their loved ones. A single word can make the world of a difference. A single word can make or break a romantic relationship. A word can also have a healing effect. You never know how this might change their day and the relationship. #3. Surprise Notes to Keep The Romance Alive in Your Relationship. You know what screams romance? Simple little surprise notes. Slide one in your partner’s pockets or wallet. It could be as simple as an “I love you” or something hot so that he has something hotter to look forward to in the evening. This immensely helps keep the spark in the relationship. He might be having a hard day at work and he discovers your little note in the midst of all that. That will take his mind off the chaos and would put him into ease. Surprise notes act as a great mood uplifter. What’s better? He would feel that you care. Yes, of course, you do care for him. But sometimes, it needs some showing. Not in an extravagant way. Subtle little hints like these can go a long way. This is also a really sweet gesture to keep him happy and speaks tonnes about your love for him. It doesn’t matter if yours is an old relationship or a new one. Date nights are essential. Make a plan for the evening and get dressed up for him as you did on the very first day. When you are this busy, making plans becomes a part of life. At work, you are planning things a year earlier. So it should not take much to plan a date night for the weekend or so. Also, dress up a little. Men love it when someone dresses up for them. It makes them feel that you are trying. When you are not making any effort to look good for them, they might feel otherwise. Of course, they love you just the way you are. There is no denying that. But simply dressing up for the night would bring back the fire that was there in the first few months. And boy, wouldn’t that be amazing! To live all those days all over again? All you need is some management skills. And when you are this successful, know that you already have it in you. You only need to make use of it in another area of your life. So plan date nights try some whisky and enjoy the soul food together. #5. Surprise Him to Keep The Romance Alive. Who doesn’t like to be surprised? And so should you surprise your partner time and again. This is a great way to keep the spark in your relationship. And these surprises do not necessarily have to be extravagant. However, it all depends on how you want it to be. It could be a little celebration surprise of a promotion of your partner at work. Or not. You do not need any reason to celebrate life. Similarly, you do not need a reason to surprise your partner. The fact that they are with you through thick and thin could be a reason enough. You can try any gifts for him/her for the surprise. A candlelight dinner can work wonders. Show your impressive cooking skills and make him a delicious meal. You must have heard that the way to a man’s heart is through his stomach. Well, you can make your way through this dinner. Of course, there are other ways to get to your man’s heart. Maybe plan a surprise birthday party for him by inviting his mother over? If he is a momma’s boy, he would worship you for it. It could also be concert tickets of his favorite artist’s show. Or a trip to his favorite tourist destination. This could also be a breath of fresh air for both of you. So, a surprise could be just about anything. #6. Do Something Together to Keep The Romance Alive. Remember during the first few months of knowing each other? You both would explore each others’ likes and dislikes. In doing so, you have both known what all you like and what you don’t. There you found a common ground as well. Where you both struck the chord and went all “SO DO I”. Bring that out again and build on it. Meaning, do something together—something which you both love to do. Try following the game together if you love football. Try watching your favorite TV series together. Better yet, work out together. Go for a run together. Race each other, if you must. This keeps the friendship aspect in the relationship alive. Being each other’s friend is the most important thing in a relationship. In fact, you should be friends first, and then partners. When a level of friendship is ensured, you reach a standard of trust and comfort—an irreversible comfort. So the value of being friends cannot be emphasized enough. This definitely requires that you do things together. You do not have to give a lot of time to this. It could be just a few hours in a week or so. But it is necessary that you do so. It is always quality over quantity. So, don’t worry even if it is for a small amount of time. Just make sure you are having fun. And a substantial amount of it. This goes without saying. A quick hug or a man melting kiss can mean a lot to your partner. And also for you. Yes, you are extremely busy and cannot do much about it. But a quick goodbye kiss and a hug every time you see each other is a sweet gesture. Not only that, it maintains the warmth in your relationship. And this is much more important than you can imagine. Remember it is the little things which matter. Simple gestures like a random hug and a kiss would mean a world to your partner. Make this a habit, so it comes to you naturally even when you do not remember to do it. Further, holding hands while you are walking also has the same effect on your relationship. This helps keep the relationship feeling fresh and also strong. You are holding hands and hugging each other every time you see other. This is a symbol of your unflinching bond. It is almost like a physical manifestation of the love you have for each other. Sometimes you need to show that you love each other. There might be times when your partner might feel like you do not have the same feelings anymore—when you are too busy with your work. In such situations, make them feel like they are loved. Give them a hug when they need it. With sweet gestures like these, there wouldn’t come a time that your partner might feel unloved. No matter how busy you are, you have to make some efforts to save the romance in your life. It is unhealthy to be busy to that extent that you are sacrificing other important parts of your life. So, make sure you are following these simple little gestures to keep the romance alive in your relationship. It really doesn’t take much to do so. Just be a little considerate and things will fall into place. 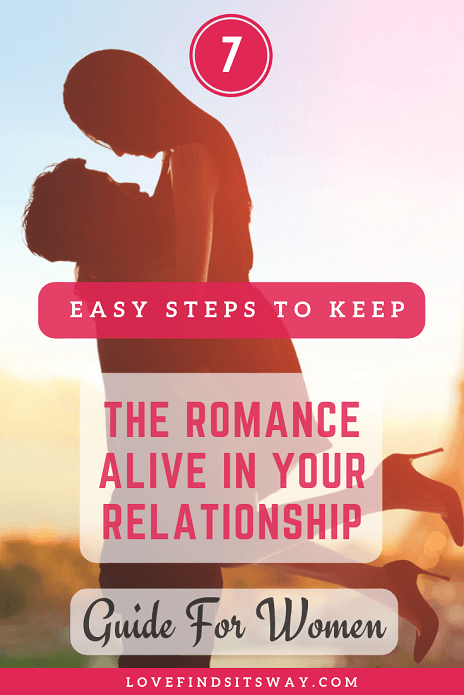 If you loved reading this guide on how to keep the romance alive in your relationship then you'll also love this 1 minute FREE video below. Before you leave Watch This 1 Minute FREE Video Here to unravel the secret techniques and psychological triggers you can use to seduce your man and keep him wanting more. . .